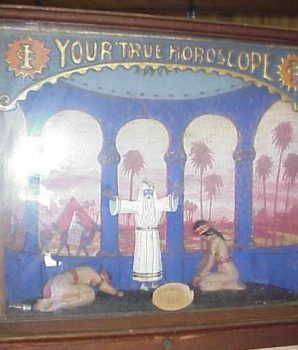 Original 1920’s Exhibit Supply Your True Horoscope Machine. 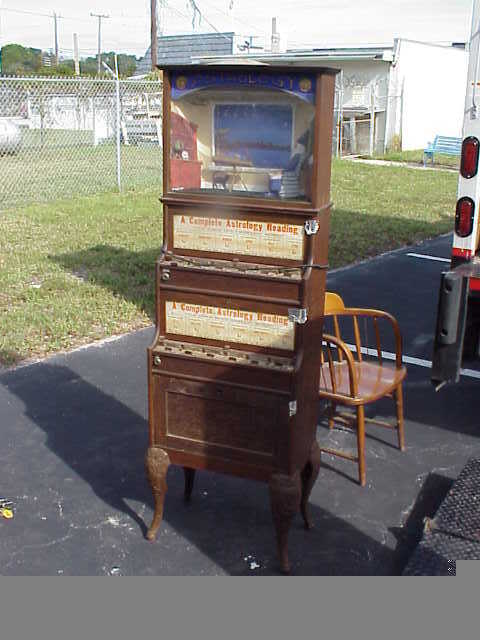 Authentic machine with original top marquee “Your True Horoscope”. 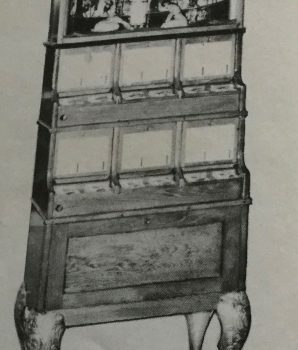 Complete with cards, interior paper mache figurine display, solid oak wood case, four ornamental cast iron legs, and key included. 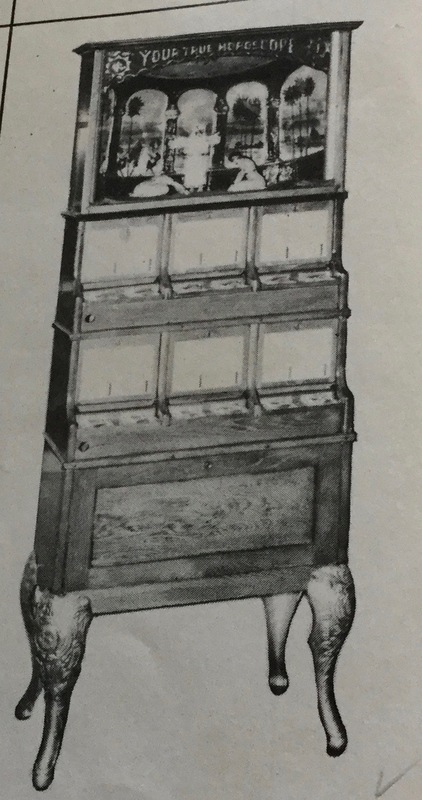 This machine has 12 slots – one slot for each month of the year. The area over the slot has an instruction card giving the month of the year and directions telling the player how to obtain his/her horoscope. There is a large compartment in the lower cabinet for storing stock. 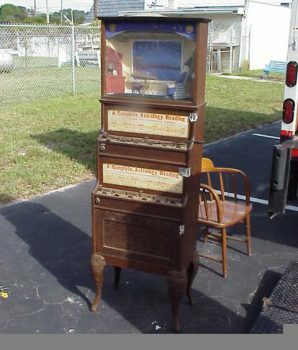 A truly handsome Exhibit Supply machine for a collector. Description from the Drop Coin In Here, “Select your reading from the month of your birth. The illuminated mystical scene features a paper cache swami and his two voluptuous attendants. Exhibit Supply Co, 1932. 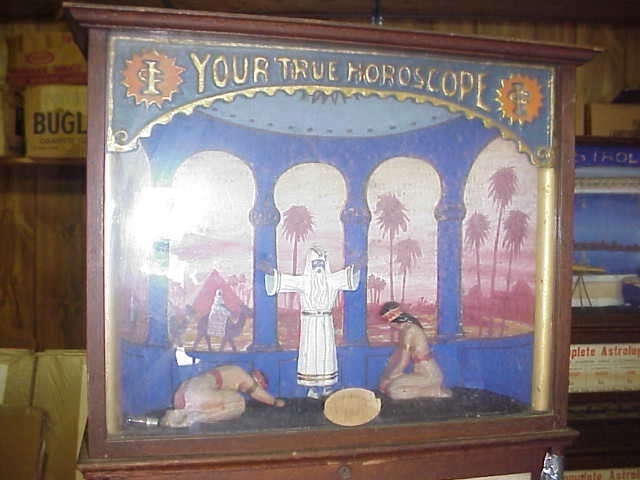 Wir verkaufen auch die Mills 12 Month Mills World horoscope fortune telling floor model. Für mehrere Artikel bietet Gameroom anzeigen eine kombinierte Rate Versandkosten zu reduzieren. Zögern Sie nicht uns zu kontaktieren, wenn Sie weitere Informationen über unsere antiken Sammlerstücke zu verkaufen möchten. Bitte rufen Sie für den Versand Zitat.